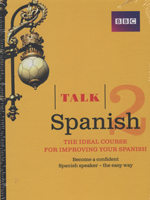 Whether you’re returning to the language and don’t want to start from scratch or you’ve completed an introductory course, Talk Spanish 2 is the ideal way to take your Spanish to the next level – fast. With its clear and effective approach, you’ll soon be able to engage in increasingly sophisticated conversations and express opinions on a wide range of subjects from food to property, as well as get to know people and cope confidently in everyday situations. Express yourself more confidently on interesting and contemporary topics.